– For building bridges from deterministic, linear and Cartesian thought and word use, by exploring our observations of the environments and their living systems affecting our ideals. A diverse work group of 6 to 20 people would be assembled, helped by a facilitator, needing about an hour to just go through the basic 3Step process. 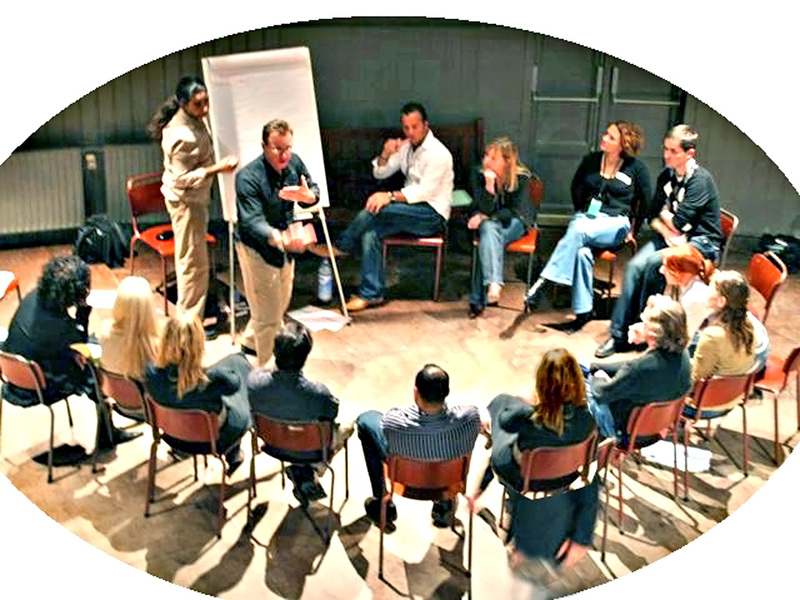 It’s NOT a discussion group, of people offering opinions, but a learning group of people offering connecting observations. During the session they’d need to be able to write as they talk, building on each other’s observations, starting from being given or choosing an ideal goal to work with. They’d use that ideal to lead them on an exploration of what people in the group already know from observing their cultural, economic & ecological environments, sharing with each other things they’ve seen are happening that could affect achieving the ideal. The product is a large collection of freshly shared observations on what’s happening and how it connects; they’d need to work with to proceed to planning for investments in changing their environment. To work well in the UN’s OWG setting, a few work groups might be organized in the same space, to work at the same time, each with their own facilitator. A prior process of facilitator training is needed, on now how to recognize environmental systems at work and ways of raising productive questions to help work groups fully explore what they know. Facilitators should have a combination of interests in human and natural economies, social science and natural science, some management and organizing experience. A facilitator’s guide to the method and the systems science behind it is in preparation. It’s easy for people to talk about the ideals they’d like to see in the world, and talk endlessly about them. Ideals don’t tell you much about how to change the world to bring out your ideals, though. So I designed a very simple way to draw people into exploring the working parts of their own cultural & economic environments, that their ideals will need to work with, to help suggest practical interventions designed to “work with nature” to bring out their ideals. I call it the 3Step process, and have been developing it in part prompted by Ambassador Korosi having showed some interest in my efforts to steer the OWG process toward studying what SDG’s need to work with to succeed. People tend not to be drawn into thinking about how the complex connecting parts of their environments actually work together, though, being more comfortable just thinking and talking about how their own values and how their own mental environment works. But, if we have important ideals, that can only be achieved working with the world around us, that can draw people into learning how to turn their ideals (SDG goals) into practical ways to get involved (SDI interventions) to bring out their ideals in their real environment. 3) Possible ways to intervene and bring out that ideal, working with those environments. Note: While others are talking try to both listen carefully and take quick notes on thoughts that come up as they speak. Ask the guide to suggest other things to look for if the flow of ideas lags. Don’t be sidetracked to dwell on any one subject. During and after the discussion collect everyone’s notes on a common note page, like a TitanPad, a chalk board, a Wiki etc., to solidify the rich variety of ideas discussed, understood as valuably interconnected starting points to think over in further study. The process both brings people with different viewpoints together to see how useful the different things they’re aware of about how their environments work can be when combined, and also to draw people into exploring just how much they already know themselves, freed to explore with interest what they’ve observed about how things work, without preconception for how the information will be used. I tried using it in a Commons Cluster conference call a couple months ago. It worked splendidly to bring out lots of productive observations no one person could have collected. Some work on the method is still needed, to make it more of a real tool to use rather than just a cool way to bring up interesting new issues. It’s a scientifically designed method for bringing out what groups of people can see they’ll need to work with in their environments to achieve their ideals. If developed as part of a process for designing real interventions to invest in for changing the environment, it will also help greatly expand the discussion general discussion of how to work with nature’s working parts. 3. Instead of the 3rd step, a period for discussing possible interventions at the end, you could have people take 5 minutes to work independently and write down one or two suggested intervention ideas to propose, in 20 words or less. Then to end the meeting each person could read theirs. That would end the meeting with a sort of “surprise package” of forward thinking, and help motivate people to contribute their notes to the wiki or public pad. 4. for youth groups, after coming to a focus on some ideal they feel passionately about, you could make the environmental observations of Step 2 a guessing game, with each person getting a turn to think of and give hints to others trying to guess something they know of happening socially, economically, politically or ecologically that is important to take into account. 5. somewhat like #1, you could have a 15min “world witness” period just before coffee hour as a regular part of a church service. Some places it would be “a crazy idea”, other places not. The 3Steps approach is highly flexible and versatile, if you prepare a bit and get people to “just bear witness” to what they can see happening that their ideals have to work with to get anywhere, expressing their awe of the natural world’s movements and changes it is ours to deal with. Glad you’re thinking about it. I’ve been hoping to get feedback each time I offered the basic idea of the 3Step SDG design process, using our ideals for the “world we want” to help us explore the real “world we have”, to see what we have to work with. It’s like going to “design school”, where the big task for an artist learning how to draw is first learning “how to see”. To change a particular environment, a designer needs to first learn to discover what’s in the environment to work with, and like anything, it takes learning new habits. It does help to have a vague idea what you’re looking for, like the ideal statement of an SDG, but having any other preconception of what you’re looking for will blind you to what’s really there. As one instructor put it once, “every design should begin with reading book zero”. It’s usually the most important step in a design, and leads to getting the best kinds of results, just getting to know what there is to work with, in its own right. In that way it’s not so different from how anyone goes about designing a child’s Halloween costume. There may be some vague image to begin with, but the real work begins with looking through the materials available, and then trying out this and that till you find a way to make something wonderful. I’m sure you can think of lots of times where someone has only the vaguest idea of what they’re planning on making until they’ve rummaged through all the things that they might use. That’s the idea, anyway, to just get people to rummage through their cultural and economic environments, as if seeing and exploring them as if for the first time, learning about what they’ll either have or need to work with to advance the ideal they want to design for. It’s critically important to get the steps in the right order, and explore the materials of the environment you’d need to work with before making a plan for what to do. It’s like going to “design school”, where the big task for an artist learning how to draw is first learning “how to see”. To change a particular environment, a designer needs to first learn to discover what’s in the environment to work with, and like anything, it takes learning new habits. This “learning ‘how to see'” is the key issue for me in “transforming” an old educational system that actual seems to close down that “open-seeing” to “discarding” any idea that isn’t immediately familiar to one’s already habituated “ways of seeing” and some of the “blinder prejudices” (and some actually are indeed prejudices) that one has not learn well to easily “excavate” and thus remain aware of, especially in understanding a “new” and “different” environment. Key, so key to that is the ability to “listen openly” to those from that different environment and understand the world through their “ways of seeing” and “hearing” and more their analysis of the problem(s) to address. This is that critical “design” process step that is so key for me as an educator trying to train minds/eyes/ears and hearts to “see” in “global” more creative, right brain ways because otherwise too much of the non-linear, non-verbal communication is missed and thus the problem(s) itself poorly or only partly understood. This is that critical mis-step that I think too often sets us from the outside trying to help, for failure: you cannot really help solve problems you didn’t really fully grasp. True “open-mindedness” in a reductionist, linearly, overly-rationally trained world or previous education system is to me the hardest and least understood of the skill-sets needed to do this. What I call the “emotional/social and cultural intelligence skill sets” that most “elitely-educated” Westerners are negatively trained in, if at all (in worst cases creating unintended arrogance and ego-investment in “their” ideas over all others). This is also a skill set that needs to be explicitly “re-taught” to combat this tendency. It is my “hardest” work in trying to explain the underlying “transformative” premise of the new educational model the TEF is supposed to represent, given that I and most of us involved in these issues at these levels were so “well-trained” in the “old” more limiting frames. For myself, I spent years “re-learning” this from the children I taught, so much more willing to teach me gently and because I could not at first “understand” why how I was taught to teach was actually “hurting” their learning and their hearts. That was motivation enough to get me to understand why and why emotional intelligence and that necessary empathetic listening is so critical to all true learning. I’m a natural systems scientist, that studies both how the organizations of nature develop and operate and also how they’re perceived by popular and professional communities. Maybe the most profound thing I’ve found is that “popular social culture trumps objective science” just about everywhere. It seems to be because, for various reasons, “science doesn’t work socially”. We need **something that works socially** for a human society to establish itself and be sustainable, a very basic social requirement seeming to stem from how human societies first developed. So…. it’s the social networks which end up being responsible for defining the foundations of our beliefs, and deciding what is meaningful to the society, creating our common reality and the nature of our experience of it. The miracle is that all social networks more or less equally *experience* the natural world and how it works, but generally don’t study it. As a result… we end up defining our shared ideas about reality without actually studying how the natural world works too. That social role in defining our cultural reality evidently holds true **even within the scientific and business communities**, as the basis for the many “silos” of exclusive knowledge that permit only their version of reality of the wider social agreement on the nature of the culture’s common reality. …… So to give social networks a better foundation on which to build our common “realities” I devised a neat trick. It’s for getting them to look at what’s happening in the natural world’s, without any preconception as to “what it’s for”. It helps people notice how much they actually knew about how their world works but never put together before, and discover what they need to use and work with to get it to work for them, but may have never really asked before.